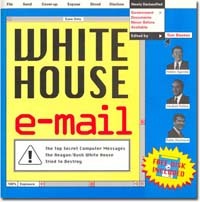 "White House Told to Provide E-Mail Info"
"Court weighs expediting missing White House e-mail suit"
Washington DC, January 8, 2008 -In an Order issued today, Magistrate Judge Facciola of the United States District Court for the District of Columbia ordered the White House to answer questions about over 5 million missing e-mails generated between 2003-2005. Noting that the need for information on the missing e-mails is “time-sensitive” because of the risk that stored copies of the e-mails “are increasingly likely to be deleted or overridden with the passage of time,” the Court demanded answers in a sworn declaration by January 15, 2008 about the location of the missing e-mails. The order issued today comes in National Security Archive v. Executive Office of the President (EOP), et al. Previously, Judge Kennedy ordered the preservation of EOP backup tapes and the consolidation of this case (filed September 5, 2007) with Citizens for Responsibility and Ethics in Washington (CREW) v. Executive Office of the President, et al. (filed September 25, 2007). "I wouldn't rule out that there were a potential 5 million emails lost"
"[W]e are aware that there could have been some emails that were not automatically archived because of a technical issue." "CREW has yet to provide any basis for their assertions -- be it their original assertion, or their new claim. We are aware that some e-mails may not have been automatically archived in the past, but they may be available on backup tapes. Unlike what the liberal group CREW has asserted, we've never been without a backup system. The Office of Administration at the White House has been maintaining and preserving backup tapes for the official email system."